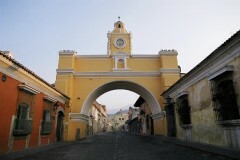 Wander the cobbled streets and plazas of colonial Antigua, the graceful former capital. 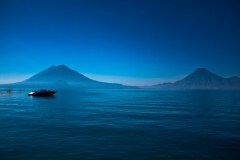 Relax along the shores of the volcano-fringed Lake Atitlan. Brace yourself for the colourful highland market at Chichicastenango, a full-on, no-holds-barred sensory overload. Spend a night in the pristine jungle and have the chance to explore the majestic ruins of Tikal long after the crowds have departed. 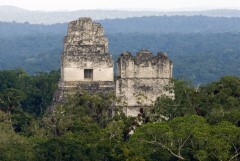 View Palenque’s atmospheric Mayan ruins in the heart of the jungle. Climb to the top of Uxmal’s Grand Pyramid and be rewarded with a breathtaking view. Visit Chichen Itza, the most famous of Mexico's Mayan ruins. Relax on the perfect sun-kissed beaches of the tropical Mayan Riviera. 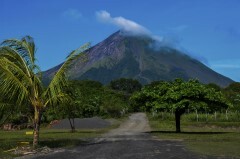 Admire the smouldering Arenal volcano whilst relaxing in beautiful hot springs. 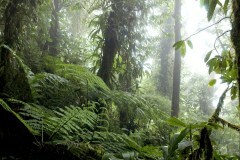 Visit the world famous Cloud Forest of Monteverde. Monteverde Cloud Forest Reserve - a mystical temporal forest hiding a myriad of bird life. 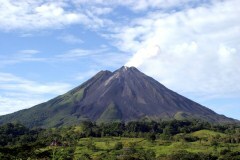 Admire Costa Rica's most active and spectacular volcano in Arenal. 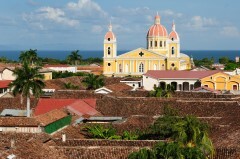 Explore beautiful Granada, with its lakeside setting and wonderful colonial architecture. Enjoy the creativity and a variety of Nicaragua art at the finest handicraft market in Masaya. 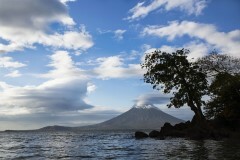 Visit Ometepe Island with its mysterious twin volcanoes. 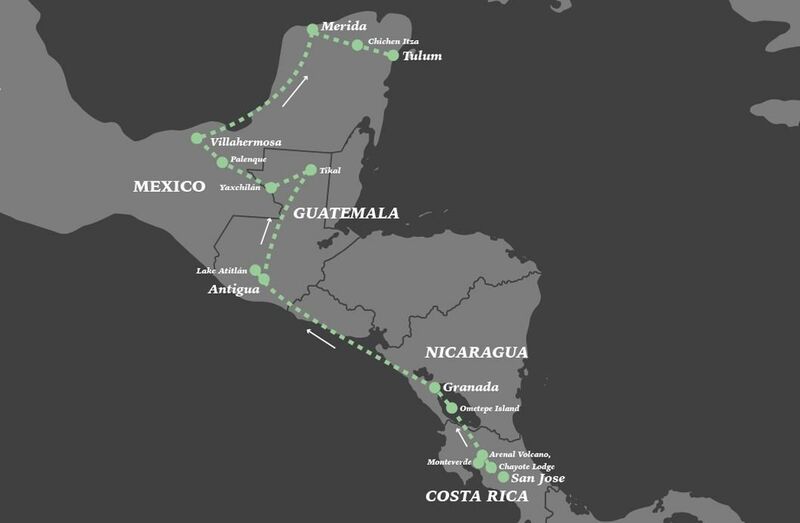 Day 11: Granada to Managua & flight to Guatemala City. Transfer to Antigua. 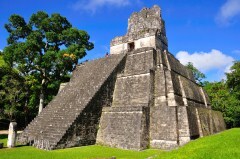 Add on a trip to Belize and enjoy its laid back charm, pristine jungle and Caribbean Islands. Further explore Mexico's charming colonial towns with a visit to Oaxaca and San Cristobal. Extend your beach time with more relaxation time on the Mayan Riviera. Extensions can be offered in Cancun or Playa del Carmen. Visit San Juan de Sur, Nicaragua's favourite beach resort town. Continue to Costa Rica via the tropical forests at Rio San Juan. Take a tropical island getaway to Little Corn Island. On arrival at San Jose airport you will be met by a representative and transferred to Chayote Lodge. Located in the central highlands, San Jose boasts a moderate climate. Like most cities, San Jose has its good and bad sides with beautiful parks and museums, but a few beggars on the streets. It is big and often noisy, but even from its crowded downtown streets you’ll often enjoy a view of the surrounding lush mountains. If you have time we recommend exploring the city centre, in particular the main plaza, which is a great place to people watch. In the morning we will make our way to the Arenal Volcano, enjoying the beautiful mountain scenery and crops of pineapple, bananas and sugar cane. 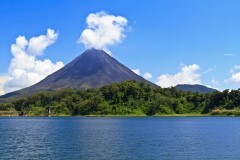 Set on the northern plains of Costa Rica, Arenal Volcano sits on the shore of Lake Arenal. 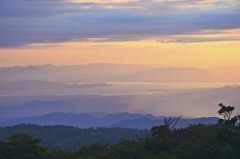 Separating two mountain ranges of Guanacaste and Tilarán, the lake was created by a hydroelectric dam. The volcano, once quite active, has been dormant since the beginning of 2011 but still is a dramatic backdrop to the town of La Fortuna. During the day, its reflection on Lake Arenal is truly enchanting. This morning is at your leisure. This beautiful and diverse region holds an abundance of incredible experiences for all to enjoy, from adrenalin adventure activities to more relaxed, leisurely walks and hot springs. In the afternoon you will enjoy a visit to the Arenal Volcano, where you will observe the natural beauty of flowers, lush vegetation, howler monkeys and exotic birds as you walk along the beautiful trails. Later, you will have the chance to unwind in the natural hot springs with views of the majestic Arenal Volcano. This experience finishes with a delicious meal before we transfer you back to your hotel. Morning depart from Arenal Volcano to the Monteverde Cloud Forest. The first part of the trip is adorned with the beautiful scenery of the Arenal Lake, which we cross by boat before driving through the beautiful scenery of the Tilarán Mountain Range and arriving in Monteverde. We arrive to our hotel in the late afternoon, with the evening spent at your leisure. Overnight at the Belmar Hotel. In the morning we will make our way to the Monteverde cloud forest, a habitat for rare flora and fauna, such as the quetzal. We visit the Tree Top walkway which is the ideal way to explore the beauty of the canopy and appreciate the incredible array of vegetation and exotic bird life that the region has to offer. Afternoon at leisure or take one of the optional excursions on offer, including the Santa Elena Reserve. Breakfast included. This morning after breakfast we will make our way across the border at Penas Blancas to Nicaragua. In the afternoon you will be transferred to San Jorge where you will take the ferry to Ometepe Island, the world’s largest volcanic island. On your arrival on the island you will be greeted by your local driver who will transfer you to your hotel. After breakfast, a local guide will pick you up at your hotel and then take you on a great Ometepe Island Tour. Your local guide will take you to visit the main sites of Ometepe Island including “El Ceibo” the best archaeological and numismatic museum of Nicaragua. You will also visit the Green Puddles lagoon (El Ojo de Agua) a natural pool of clear water supplied by a river that originates from Conception Volcano. Another site to be visited will be Petroglyphs at Finca el Porvenir. These stones, found on the lower slopes of Madera’s volcano on Ometepe, still bear the ornate carvings of the first indigenous settlers of Nicaragua. Enjoy the great views that Volcano Conception and Volcano Madera have to offer. Enjoy lunch on the shores of Santo Domingo and after return to your hotel. This morning you will spend at leisure. In the afternoon you will be transferred to Granada. You will be met by our representative and transferred to your hotel in Granada City. Following breakfast our driver and guide will pick you up for another great adventure on Lake Nicaragua. Here you will see the most beautiful islands and their rich flora and fauna. The islands were formed thousands of years ago after an eruption of nearby Mombacho volcano (now extinct). 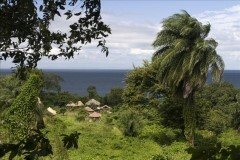 They are now covered with lush, tropical vegetation, some of them are inhabited by natives, others have vacation houses built on them, and others are still deserted. You will be able to observe some of the many species of tropical birds that live in the islands. The inhabitants (“Isleños) live peacefully in simple yet decent conditions and dedicate themselves to fishing and small agriculture, and now to tourism too. Arrive to a private ecological island, enjoy lunch there and spend some time at leisure - it is a true paradise located amidst nature, in front of the Mombacho volcano. Transfer back to the marina in a motor boat. You will be back in Granada around 4.30pm. Breakfast, Lunch included. This wonderful outdoor experience begins when you are picked up at your hotel in a traditional Horsedrawn Carriage. You will start with a visit to La Casa de los Tres Mundos art gallery a cultural academy, then the convent of San Francisco church, built in 1529 decorated with elegant paintings and pre- Columbian statues from Zapatera Island. Then you will visit Iglesia La Merced taking stars up the tower from where you will have great views of the city.., after Iglesia La Merced you will go to the Old Train Station that has just been restored located in front of Sandino Park. The last place you will visit is La Polvora, a fort where the Spanish stored dynamite and weapons in the 17th and 18th century to repel the attacks of English and French pirates. Later, you will leave Granada and will be transferred to the Masaya Areas. Transportation, bilingual guide (English-Spanish), lunch & entrances fees are included. Your tour will take you to Catarina, a small and characteristic village of Nicaragua where people work seedling nurseries, make handcraft and raise horses. Placed on top of the extict volcano 520 meters above sea level this presents a very agreeable climate. The temperature veries from 22 and 27 C° (72 & 77 F°) from here you can have a magnificent view of Apoyo lagoon, Mombacho volcano, Granada and Lake Nicaragua. Lunch included in a beautiful typical restaurant amidst nature. After Catarina you will visit the ancient highland villages of "La Meseta" to visits the Mesa artisans workshops of San Juan de Oriente. This precious town has colonial period houses, churches and a hardworking native population. Then visit the finest Handicraft Market in Masaya where you will enjoy the creativity and a variety of Nicaraguan art at bargain prices. Our day tour ends with a visit in the late evening to the First National Park created in Nicaragua in 1979, one of Nicaragua's most interesting and beautiful natural phenomena. It comprises an area of 54 km2 with more than 20 km of scenic roads and trails, leading to and around the one impressive volcano and five formidable craters; one of them currently displays gaseous activity and incandescent lava lake in its interior. As you approach it, you see an eerie, orange glow and swirling steam. Standing at the wall, you are able to peer into the crater and see the lava lake churning and splashing - an incredible thing to experience first-hand! A NATGEO team recently finished exploring the volcano… Eventually transfer back to Granada. Please note that due safety restrictions, visitors are only allowed to stay 15 minutes near the crater. Today you will be transferred to the international airport in Managua for your flight to Guatemala City. 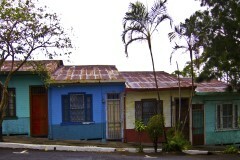 On arrival in Guatemala City you will be met by a representative and transferred to your hotel in Antigua 45 kms away. Once the third largest city in all of Spanish America, Antigua served as Guatemala's capital city for more than 200 years until it was destroyed by an earthquake in 1773. Antigua today is a peaceful, partially restored colonial city that is a pleasure to explore. 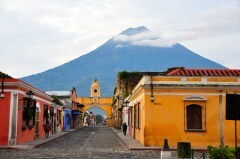 Volcan Fuego rises to the roof of the world above the streets of Antigua. Once the capital of Guatemala and all Central America, Antigua resembles a living ruin. Mammoth churches and palaces tell the story of Antigua's past glory, and restored facades speak of a bright future for this wonderful city. This morning we’ll tour the city and admire Antigua's gilded cathedrals. The afternoon is yours to rent mountain bikes to explore the countryside, visit a coffee finca or macadamia nut plantation, or simply people watch in the main plaza. We travel into the heart of the Guatemalan Highlands to Lake Atitlán in the western highlands of Guatemala, which is often called one of the most beautiful lakes in the world. Located at over 1500 metres above sea level, the lake reaches depths of 324 metres and is surrounded by three majestic volcanoes - Tolimán, Atitlán and San Pedro. We’ll spend a night in beautiful Panajachel , considered the jewel of the highlands and inhabited by the Cachikel people for over eight hundred years. As we wander around Panajachel and its surrounding villages, you will observe this people’s daily life and be amazed by the skills of the women weavers. Today you’ll take a small passenger boat across the azure-coloured waters of the lake to the charming village of Santiago Atitlán. Get ready for spectacular views of the surrounding volcanoes and insight into a thriving Mayan community. Villagers in Santiago Atitlán still adhere to the traditional lifestyle of the Tz'utuhil Maya and on our walk we'll see many people cloaked in brightly-coloured, hand-woven clothing. Art galleries filled with oil paintings line Santiago’s main street, depicting busy market scenes and typical life in the highlands. We may also visit Maximòn and leave an offering to this curious and revered deity before returning back across the lake to Panajachel. A visit to Guatemala would not be complete without the chance to visit the famous market of Chichicastenango. This beautiful town, surrounded by valleys and shadowed by mountains, has many shamanistic and ceremonial overtones. Its large market brings villagers from throughout the region who often arrive the night before and sleep on blankets in the market square. Rising early, they set out their colourful fruits, vegetables and handicrafts. 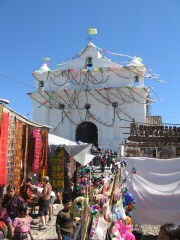 The market disperses in the early afternoon, so we will then travel back to Antigua where we’ll spend the night. *Take note that market days are Thursdays and Sundays, however we can rearrange this itinerary to make sure you’re there on the correct day. A representative w ill pick you up from your hotel and transfer you to Guatemala City airport for your departure flight. An early morning flight takes you to Flores in the tropical lowlands of the Petén Jungle and the home of the ancient Maya. After meeting up with your guide, you'll continue on to the ruins of Tikal and check in to your hotel located in the national park. After lunch at your hotel you will enjoy a guided tour of the Tikal site, where you'll encounter towering pyramids rising above the thick jungle canopy and learn how the city thrived as an important religious, scientific, and political centre for fifteen hundred years. Today, the pristine forest engulfing the ruined city is home to howler and spider monkeys, white-lipped peccary, brocket deer, coatimundis, toucans, scarlet macaws, parrots, ocelots and the seldom seen jaguar. The sheer scale of the ruins at Tikal may at first seem daunting; however by staying within the park you will have the opportunity to further explore the ruins beyond the central area. Wander endlessly into the maze of smaller structures and outlying complexes hidden in the jungle growth, and if your energy levels are high enough to make it to the top of Temple IV you won’t be disappointed! Amazing views of the surrounding jungle canopy will greet you from the top of the highest structure within the complex, and once the crowds have left the jungle animals comes to life. For those interested, you can choose to take an optional morning tour of the park to enjoy the sun rising over the jungle. The tour is at your own expense and can be reserved at your hotel. Later in the morning a representative will pick you up from your hotel and transfer you across the border into Mexico. Transfer to the River Usumacinta, where we will navigate to the border line of Guatemala and Mexico, Bethel / Corozal, towards the archaeological site of Yaxchilán, spectacular for its jungle atmosphere. Next we’ll travel to Escudo Jaguar where we’ll have lunch (at your own expense). We’ll then continue on to Palenque where the evening is spent at your leisure. Today we will visit the archaeological site of Palenque, a World Heritage Site, located 7km outside the town of Palenque. Overlooking the swampy plains that stretch northward all the way to the Gulf Coast, Palenque flourished between AD600 and 800, when its influence extended throughout the basin of the Usumacinta River. The site, surrounded by rainforests filled with toucans and howler monkeys, is made up of some five hundred buildings spread over 15 sq km. Only a few have been excavated. We will explore the magnificent ruins, including the Temple of the Inscriptions (the tallest and stateliest of Palenque’s buildings), the Temple of the Sun (crowned with a prominent roof comb), and The Palace, with its maze of corridors and rooms. Many other beautiful buildings are also available for exploration. Return to your hotel where the evening is spent at your leisure. *If you’d like to explore the rainforest ruins of Chiapas in more detail then we recommend adding an extra day and taking a tour of Yaxchilán and Bonampak, located deep in the rainforest. A representative will pick you up from your hotel and transfer you to Villahermosa airport for your departure flight. Upon arrival at Merida airport you will be met by a representative and transferred to your centrally located hotel. The afternoon is at your leisure to explore the city. Built more than four hundred fifty years ago on the site of T’ho, an ancient Mayan city, Merida is the social and economic centre, as well as the capital, of the state of Yucatán. Merida’s downtown area features a large, tree-shaded central square. 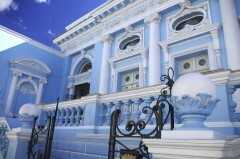 The city’s main boulevard, Paseo Montejo, is home to impressive European-style mansions. Though a bustling city of about seven million, Merida retains its colonial charm and has a laid-back tempo that delights visitors. If you have extra time, we recommend adding a few additional days to visit the surrounding area. You’ll see pink flamingo sanctuaries and crystal-clear cenotes (sinkholes) that are easily accessible from Merida. 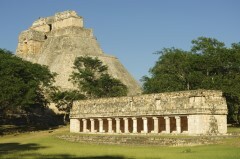 We will visit the archaeological site of Uxmal, a World Heritage Site, located 80km south of Merida. Its architecture is characterised by low horizontal palaces set around courtyards, decorated with a profusion of symbolic motifs and sculptures depicting the long-nosed rain god Chaac. We will explore the magnificent buildings, including the Nunnery, the House of Turtles and the House of the Magician, which dominates the site. We’ll continue to Kabah, with its amazing Palace of the Masks, covered in nearly three hundred masks of Chaac before returning to Merida. 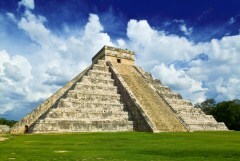 - Pyramid of Kukulcan, its height and striking geometric design the most prominent of this site. 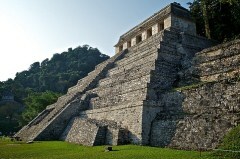 - The Great Ball Court , the largest and most impressive in Mesoamerica. - The Sacred Cenote, a natural well used for human sacrifice. We’ll also see many other beautiful temples. 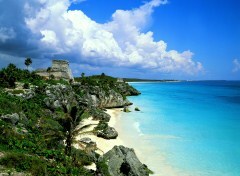 From Chichen Itza we’ll head to the white sandy beaches of Tulum, where you will enjoy a day at leisure. Today is at your leisure to enjoy the magnificent beaches and crystal clear waters of the Riviera Maya. 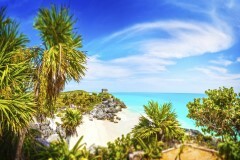 Apart from its excellent beaches Tulum possesses some impressive cenotes (underwater sinkholes) which offer fantastic snorkelling opportunities and you should also consider a side trip to its breathtaking Mayan ruins. The Tulum archaeological site is the only walled city in the Mayan empire and the only one located by the edge of the Caribbean. The major construction is its castle, a handsome pyramid perched on the edge of a cliff high above the pearl-white beaches below. Today you will complete your trip and be transferred to the airport in Cancun or if you are extending your trip we can transfer you to selected resorts in the Riviera Maya including those located in Cancun or Playa del Carmen.